Fatigue is one of the most common symptoms of Multiple Sclerosis (MS), and it can be extremely debilitating and burdensome—sometimes even more so than the physical symptoms of MS, like muscle weakness or balance problems. In addition to being disabling, MS-related fatigue is a particularly tricky symptom to treat. While Provigil (modafinil) and Symmetrel (amantadine) are commonly prescribed for MS fatigue, there is not much scientific evidence to back up their use. Also, these medications have some undesirable side effects. For example, Provigil (modafinil) can cause insomnia, which can worsen a person's fatigue. Imagine being up all night—this is only going to perpetuate, not help, your exhaustion. So most MS experts (and people living with MS) are urgently searching for a solution to combat MS fatigue. While lifestyle habits like exercise have shown promise, many are also seeking out a "fatigue-fighting pill." Coenzyme Q10, also known as CoQ10, is an antioxidant found in nearly every cell in your body. As an antioxidant, it neutralizes free radicals, which can damage the cells in your body. By fighting free radicals, coenzyme Q10 is believed to keep cells healthy, improving their functioning and energy metabolism. Coenzyme Q10 is also believed to have anti-inflammatory properties. This means that it may calm down a person's immune system, which we know is overactive in a person with MS. In fact, research has shown that supplementation with coenzyme Q10 lowers certain inflammatory markers, like tumor necrosis factor (TNF), in the bloodstream. So, can a supplement like coenzyme Q10 ease your or your loved one's MS-related fatigue? It may be worth a try, according to one study. That being said, be sure to discuss any new supplement or medication with your doctor first to ensure it is safe and right for you. In a 2016 study in Nutritional Neuroscience, 45 participants with multiple sclerosis were randomized to receive either 500mg of coenzyme Q10 or a placebo pill daily for 12 weeks. The study was double-blinded, meaning neither the participants nor the investigators knew who received coenzyme Q10 versus who received the placebo pill. At the beginning of the study, a scale commonly used to quantify fatigue in MS (called the Fatigue Severity Scale) was administered to all the participants. It was then administered again at the end of the study (at 12 weeks). The Fatigue Severity Scale (FSS) consists of nine statements that are scored on a seven-point scale, with one meaning "strongly disagree" and seven meaning "strongly agree." The overall score is the average of these nine numbers, with higher scores indicating more severe fatigue. An example statement from the scale is "fatigue interferes with my work, family, or social life." If you strongly agreed with this statement, you would score a 7 ( a high score). Results of the study found that participants who took coenzyme Q10 had a significant decrease in their FSS score—this means less fatigue—as compared to the participants who took the placebo pill. In the same study, all of the participants were also assessed for symptoms of depression using the Beck Depression Inventory (BDI). By the end of the study, the participants who took coenzyme Q10 had a significant improvement in their depressive symptoms, as compared to the participants who took the placebo pill. The results suggest that coenzyme Q10 is beneficial in easing both fatigue and depressive symptoms in participants with MS. This is an exciting notion, especially since coenzyme Q10 is available over-the-counter. Coenzyme Q10 is also available in a number of formulations including soft and hard shell capsules, tablets, and even an oral spray. This all being said, the study was small (only 45 participants) and lasted 12 weeks. Larger and longer-term studies examining the effects of coenzyme Q10 in people with MS need to be done. It is also important to understand that Coenzyme Q10 is not approved by the US Food and Drug Administration (FDA) for treating any medical condition, including fatigue in MS. Even though coenzyme Q10 is a supplement and available without a prescription, it should only be taken under the supervision of a doctor, especially since it may not be right for everyone. For example, in some people, coenzyme Q10 can lower blood sugar. This may be problematic in people with diabetes who are also taking medications that lower blood sugar levels. It may also interact with some medications like blood pressure medications or blood thinning medications. So even if your doctor gives you the OK to try coenzyme Q10, you may need special monitoring. Also, the dosage used in this study is fairly high at 500mg per day. 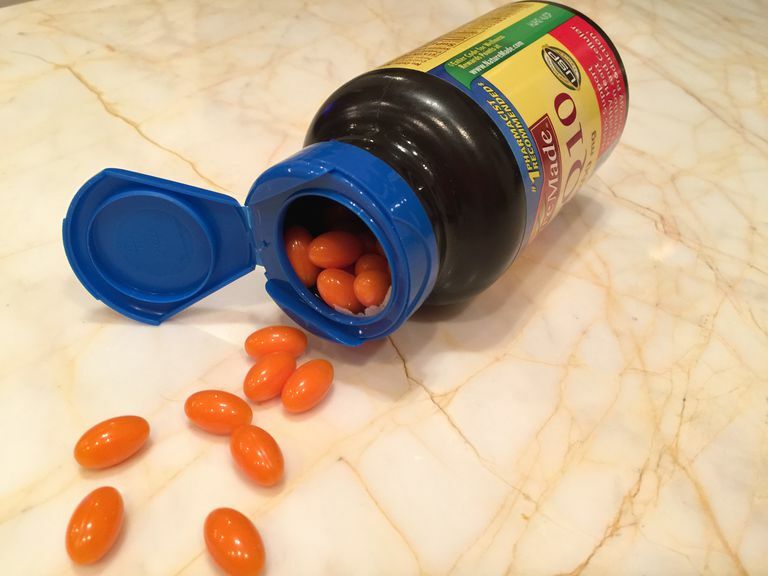 Most supplement bottles say to take no more than 200mg per day. If you are going to try this supplement, confirm the right dose with your doctor. For instance, taking too low of a dose can be sub-therapeutic (in other words, not giving the supplement a chance to help you). Coenzyme Q10 has not been examined much in multiple sclerosis, but this may be changing. In fact, a study funded by the National Institute of Neurological Disorders and Stroke is examining the effects of a drug called Idebenon—a man-made drug that is similar to coenzyme Q10. The study is examining the safety and effectiveness of Idebenone in treating people with primary-progressive MS. The study is specifically comparing the rate of progression of brain atrophy (shrinking of the brain from loss of nerve cells) in people taking Idebenone versus people taking a placebo. This study is a Phase I/II study, so very early, but exciting nevertheless—especially since there are currently no FDA-approved medications for treating primary-progressive MS. While a lot more scientific investigation needs to be done on the safety and benefit of taking coenzyme Q10 for treating symptoms of MS like fatigue, or even the disease itself, this 2016 study in Nutritional Neuroscience is a good start. Mezawa M et al. The reduced form of coenzyme Q10 improves glycemic control in patients with type 2 diabetes: an open label pilot study. Biofactors. 2012 Nov-Dec;38(6):416-21. Sanoobar M, Dehghan P, Khalili M, Azimi A, Seifar F. Coenzyme Q10 as a treatment for fatigue and depression in multiple sclerosis patients: A double blind randomized clinical trial. Nutr Neurosci. 2016;19(3):138-43. Sanoobar M et al. Coenzyme Q10 supplementation ameliorates inflammatory markers in patients with multiple sclerosis: a double blind, placebo, controlled randomized clinical trial. Nutr Neurosci. 2015 May;18(4):169-76. University of Maryland Medical Center. (January 2015). Coenzyme Q10. U.S. National Institutes of Health. (October 2016). Double Blind Placebo-Controlled Phase I/II Clinical Trial of Idebenone in Patients With Primary Progressive Multiple Sclerosis (IPPoMS). Does Evidence Support Naltrexone for Treating MS?